The persisting need for donor hearts as well as an increase in patient numbers suffering from severe heart failure, results in a rise in demand for ventricular assist device (VAD) support. The need and intended use for long-term circulatory support is, however, a particular challenge for these devices, as multiple criteria have to be considered. Among those, considerations for improved hydraulic efficiency, yielding in pumps suitable for long term use, can further improve the devices in terms of better hemocompatibility, longer battery life and less mechanical wear, which in turn is beneficial to the quality of life of VAD patients. 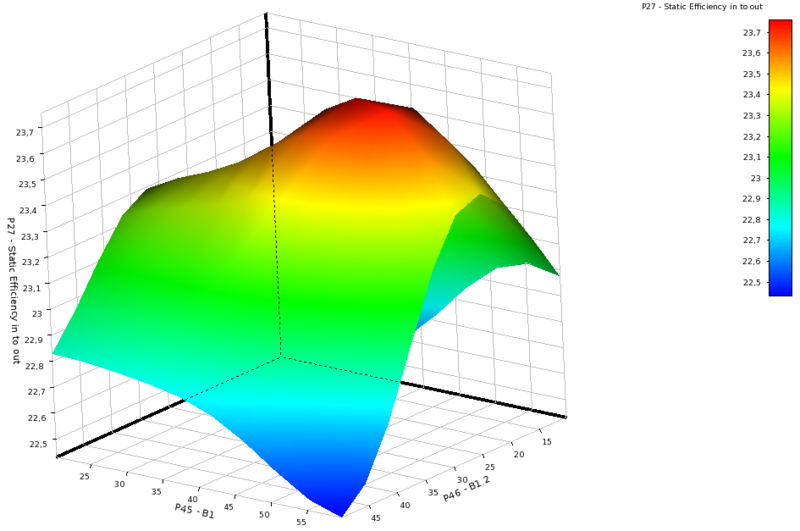 With increasing computational power and resources, complex three dimensional computational fluid simulations of blood pumps can be performed in acceptable time. In an iterative manner, simulation has been widely used as a tool for design and shape optimization or as a tool of performance prediction of blood pumps. Yet, a complex interplay between geometric and operational parameters complicates the optimization of the hydraulic performance and blood traumatization even if only CFD simulations are considered. The introduction of statistical methods to allow for efficient parameter correlation and thus, an understanding of the complex interplay between design parameters and target criteria for an efficient and hemocompatible pump design can replace the iterative process. Although this method requires an elaborate preliminary work, the key benefit represents the multi objective optimization possibility, also applicable to late stages of pump design, allowing for specific optimization of selected parameters. Response surface methodology (RSM) is used to explore the relationships between geometric variables and multiple response variables by using a minimal sequence of designed experiments (DOE) to obtain an optimal response. Using goal driven optimization (GDO), a constrained, multi-objective optimization technique, the best possible designs are obtained which fulfill the objectives or constraint. Design optimization of the pump impeller for increased hydraulic efficiency achieved an enhanced flow guidance and a more symmetric flow distribution. Increased hydraulic output allowed a reduction of operational speed of 300 revmin^-1 to have equivalent hydraulic performance. Adaptations of the volute regarding outlet diffusor shape and angle led to a significant reduction of stagnation regions and favour efficiency and low hemolysis. Design optimization of a spiral groove bearing (SGB) for hydrodynamic rotor levitation could identify, compared to an analytical design (A) and identical test conditions, a prototype ( B) with 30% increase in axial force with a 45% increase in gap flow washout and 32% increase in tilt stiffness.